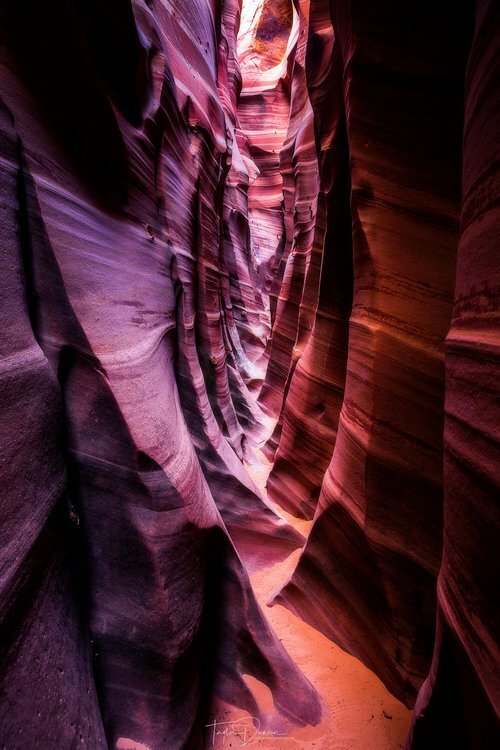 Antelope Canyon or Escalante Slot Canyons? For our brand new website and blog, I decided to let our guests be the inspiration for topics here. Gary, a distance runner, brought up the subject of the day. Why pay big money for a guided tour through crowded Antelope Canyon (Page, Arizona) when the slot canyons around Escalante are of similar beauty.... and free? Here, you can go at your own speed, which for Gary was at a run (except when scaling rocks) to see every slot canyon he could find in two days! Which brings us to Gary's next good point. One night in Escalante is just not enough to see all there is to see in these parts. Good thing we had an opening for him to stay another night! You gotta love our guests. After meeting Gary, we decided that anyone running over 15 miles a day through slot canyons can have breakfast twice! Last we saw he was picking up pears in the yard, and puting them in his backpack for his next adventure. Go Gary!